The last time I got together with my friends from the Holiday Food Party Bloggers, we were baking up patriotic treats for the the 4th of July. I don't know where the past four months have disappeared but I'm excited to be reuniting with them to make Halloween goodies. Our group always knew we couldn't pass up such a fun, sweets intensive holiday and we've been brainstorming for a while now. For me, Halloween means candy and candy means peanut butter candy. A little chocolate is good, too! And since I love all things salty and sweet together, I decided to go all out and make a tart with a sweet and salty pretzel crust and peanut butter and chocolate filling. Definitely decadent and totally worth it. I still remember our first taste of it. I cut a slice, put it on a plate with two forks and Brian and I sat on the couch to taste test it. There was moaning involved. We finished the whole thing in a weekend. We fought over the last piece. And we will look for any excuse to make it again. Enjoy! To make the crust, combine the butter, flour, pretzels, salt and sugar in a food processor with a steel blade and pulse just until it resembles course crumbs. Slowly pour in the ice water and pulse just until combined and a dough ball forms. Wrap the dough in plastic wrap and refrigerate for at least one hour. When the dough is ready, roll it out, on a well floured surface, to about a 10" circle and place it in a 9" tart pan. Prick the bottom of the tart a few times with the tines of a fork and bake in a pre-heated 350 degree oven for approximately 45 minutes or until the crust is a light golden brown. Allow to cool completely. Make the filling by adding the cream cheese, peanut butter, sugar, salt and vanilla to a bowl and mixing until completely combined and smooth. Fold in the whipped topping and pour the mixture into the cooled tart shell. Add the chocolate chips to a small bowl and microwave for about a minute until they are completely melted. Stir and allow to cool slightly. Pour the cooled chocolate over the peanut butter mixture and swirl using a butter knife. 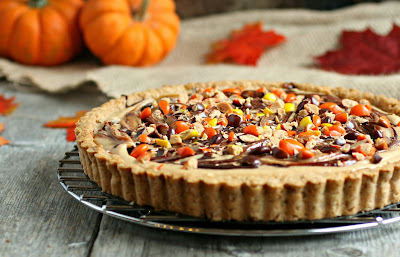 Chop the candies and sprinkle over the top of the pie. Makes approximately 8 servings. I've been drooling over your pie since I've seen the previews!!! Gorgeous! 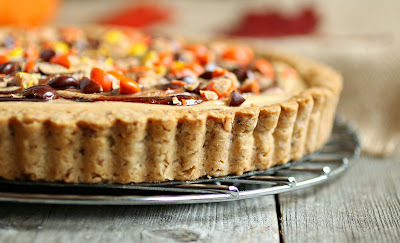 I know you're going to hand deliver a slice of this irresistible tart, right? I NEEEEEEED THIS!!!!! OMG. Come to Astoria. Bring this pie! Oh my lawdy, I need this in my life....Wooo! Anita, this is fabulous from top to bottom! And that crust...gloriously captured in pixels to hold me over until I can run this recipe in the kitchen. DAMN, Anita. You own that tart like a boss. It's full of everything I love to eat in this world: chocolate, peanut butter, and crust. I can never resist that salty sweet combo! You made me laugh with the description of you and Brian eating this. I'd be moaning and fighting for the last piece too! I know a great reason to make that tart again, for ME!!! Beautiful decadent dessert! I can imagine how fluffy this is with the Cool Whip in it. And I can't resist anything chocolate and peanut butter. I need this in my life - sounds soooooo good! 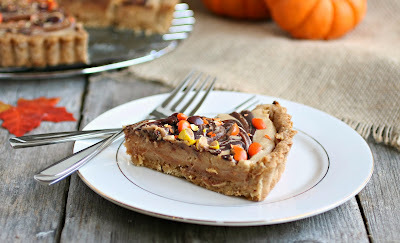 and well it have reese's in it too, YUM! Oh my gosh, how gorgeous is this tart! It's almost too beautiful to eat, but I think I'd still force myself... because, you know... peanut butter. and chocolate. and pretzel. YUM.